This article is about techniques of printmaking as a fine art. For the history of printmaking in Europe, see Old master print. 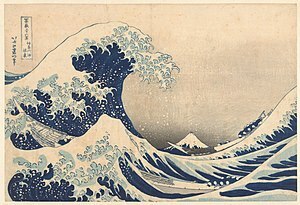 For the Japanese printmaking tradition, see Ukiyo-e.
Printmaking is the process of creating artworks by printing, normally on paper. Printmaking normally covers only the process of creating prints that have an element of originality, rather than just being a photographic reproduction of a painting. Except in the case of monotyping, the process is capable of producing multiples of the same piece, which is called a print. Each print produced is not considered a "copy" but rather is considered an "original". This is because typically each print varies to an extent due to variables intrinsic to the printmaking process, and also because the imagery of a print is typically not simply a reproduction of another work but rather is often a unique image designed from the start to be expressed in a particular printmaking technique. A print may be known as an impression. Printmaking (other than monotyping) is not chosen only for its ability to produce multiple impressions, but rather for the unique qualities that each of the printmaking processes lends itself to. Prints are created by transferring ink from a matrix or through a prepared screen to a sheet of paper or other material. Common types of matrices include: metal plates, usually copper or zinc, or polymer plates for engraving or etching; stone, aluminum, or polymer for lithography; blocks of wood for woodcuts and wood engravings; and linoleum for linocuts. Screens made of silk or synthetic fabrics are used for the screenprinting process. Other types of matrix substrates and related processes are discussed below. Multiple impressions printed from the same matrix form an edition. Since the late 19th century, artists have generally signed individual impressions from an edition and often number the impressions to form a limited edition; the matrix is then destroyed so that no more prints can be produced. Prints may also be printed in book form, such as illustrated books or artist's books. Other types of printmaking techniques outside these groups include collagraphy and viscosity printing. Collagraphy is a printmaking technique in which textured material is adhered to the printing matrix. This texture is transferred to the paper during the printing process. Contemporary printmaking may include digital printing, photographic mediums, or a combination of digital, photographic, and traditional processes. Many of these techniques can also be combined, especially within the same family. 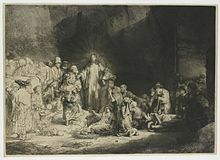 For example, Rembrandt's prints are usually referred to as "etchings" for convenience, but very often include work in engraving and drypoint as well, and sometimes have no etching at all. Woodcut, a type of relief print, is the earliest printmaking technique, and the only one traditionally used in the Far East. It was probably first developed as a means of printing patterns on cloth, and by the 5th century was used in China for printing text and images on paper. Woodcuts of images on paper developed around 1400 in Japan, and slightly later in Europe. These are the two areas where woodcut has been most extensively used purely as a process for making images without text. The artist draws a design on a plank of wood, or on paper which is transferred to the wood. Traditionally the artist then handed the work to a specialist cutter, who then uses sharp tools to carve away the parts of the block that will not receive ink. The surface of the block is then inked with the use of a brayer, and then a sheet of paper, perhaps slightly damp, is placed over the block. The block is then rubbed with a baren or spoon, or is run through a printing press. If in color, separate blocks can be used for each color, or a technique called reduction printing can be used. Reduction printing is a name used to describe the process of using one block to print several layers of color on one print. This usually involves cutting a small amount of the block away, and then printing the block many times over on different sheets before washing the block, cutting more away and printing the next color on top. This allows the previous color to show through. This process can be repeated many times over. The advantages of this process is that only one block is needed, and that different components of an intricate design will line up perfectly. The disadvantage is that once the artist moves on to the next layer, no more prints can be made. Another variation of woodcut printmaking is the cukil technique, made famous by the Taring Padi underground community in Java, Indonesia. Taring Padi Posters usually resemble intricately printed cartoon posters embedded with political messages. Images—usually resembling a visually complex scenario—are carved unto a wooden surface called cukilan, then smothered with printer's ink before pressing it unto media such as paper or canvas. 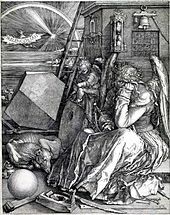 "Melencolia I", engraving by Albrecht Dürer, one of the most important printmakers. The process was developed in Germany in the 1430s from the engraving used by goldsmiths to decorate metalwork. Engravers use a hardened steel tool called a burin to cut the design into the surface of a metal plate, traditionally made of copper. Engraving using a burin is generally a difficult skill to learn. Gravers come in a variety of shapes and sizes that yield different line types. The burin produces a unique and recognizable quality of line that is characterized by its steady, deliberate appearance and clean edges. Other tools such as mezzotint rockers, roulettes (a tool with a fine-toothed wheel) and burnishers (a tool used for making an object smooth or shiny by rubbing) are used for texturing effects. To make a print, the engraved plate is inked all over, then the ink is wiped off the surface, leaving only ink in the engraved lines. The plate is then put through a high-pressure printing press together with a sheet of paper (often moistened to soften it). The paper picks up the ink from the engraved lines, making a print. The process can be repeated many times; typically several hundred impressions (copies) could be printed before the printing plate shows much sign of wear, except when drypoint, which gives much shallower lines, is used. In the 20th century, true engraving was revived as a serious art form by artists including Stanley William Hayter whose Studio 17 in Paris and New York City became the magnet for such artists as Pablo Picasso, Alberto Giacometti, Mauricio Lasansky and Joan Miró. Of the Frogs Desiring a King (1665), from The Fables of Aesop paraphras’d in verse of John Ogilby, etching by Wenceslaus Hollar. Artists using this technique include Albrecht Dürer, Rembrandt, Francisco Goya, Wenceslaus Hollar, Whistler, Otto Dix, James Ensor, Edward Hopper, Käthe Kollwitz, Pablo Picasso, Cy Twombly, Lucas van Leyden, Carlos Alvarado Lang. Etching is part of the intaglio family (along with engraving, drypoint, mezzotint, and aquatint.) Although the first dated etching is by Albrecht Dürer in 1515, the process is believed to have been invented by Daniel Hopfer (c.1470–1536) of Augsburg, Germany, who decorated armor in this way, and applied the method to printmaking. Etching soon came to challenge engraving as the most popular printmaking medium. Its great advantage was that, unlike engraving which requires special skill in metalworking, etching is relatively easy to learn for an artist trained in drawing. Etching prints are generally linear and often contain fine detail and contours. Lines can vary from smooth to sketchy. An etching is opposite of a woodcut in that the raised portions of an etching remain blank while the crevices hold ink. In pure etching, a metal (usually copper, zinc or steel) plate is covered with a waxy or acrylic ground. The artist then draws through the ground with a pointed etching needle. The exposed metal lines are then etched by dipping the plate in a bath of etchant (e.g. nitric acid or ferric chloride). The etchant "bites" into the exposed metal, leaving behind lines in the plate. The remaining ground is then cleaned off the plate, and the printing process is then just the same as for engraving. 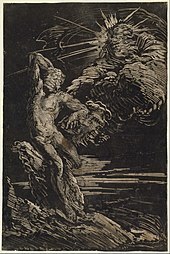 An intaglio variant of engraving in which the image is formed from subtle gradations of light and shade. 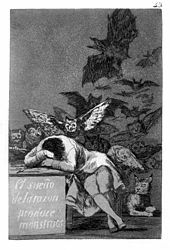 Mezzotint—from the Italian mezzo ("half") and tinta ("tone")—is a "dark manner" form of printmaking, which requires artists to work from dark to light. To create a mezzotint, the surface of a copper printing plate is roughened evenly all over with the aid of a tool known as a rocker; the image is then formed by smoothing the surface with a tool known as a burnisher. When inked, the roughened areas of the plate will hold more ink and print more darkly, while smoother areas of the plate hold less or no ink, and will print more lightly or not at all. It is, however, possible to create the image by only roughening the plate selectively, so working from light to dark. Mezzotint is known for the luxurious quality of its tones: first, because an evenly, finely roughened surface holds a lot of ink, allowing deep solid colors to be printed; secondly because the process of smoothing the texture with burin, burnisher and scraper allows fine gradations in tone to be developed. The mezzotint printmaking method was invented by Ludwig von Siegen (1609–1680). The process was used widely in England from the mid-eighteenth century, to reproduce oil paintings and in particular portraits. A technique used in Intaglio etchings. Like etching, aquatint technique involves the application of acid to make marks in a metal plate. Where the etching technique uses a needle to make lines that retain ink, aquatint relies on powdered rosin which is acid resistant in the ground to create a tonal effect. The rosin is applied in a light dusting by a fan booth, the rosin is then cooked until set on the plate. At this time the rosin can be burnished or scratched out to affect its tonal qualities. The tonal variation is controlled by the level of acid exposure over large areas, and thus the image is shaped by large sections at a time. 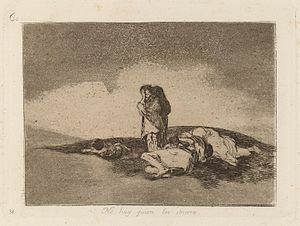 Goya used aquatint for most of his prints. A variant of engraving, done with a sharp point, rather than a v-shaped burin. While engraved lines are very smooth and hard-edged, drypoint scratching leaves a rough burr at the edges of each line. This burr gives drypoint prints a characteristically soft, and sometimes blurry, line quality. Because the pressure of printing quickly destroys the burr, drypoint is useful only for very small editions; as few as ten or twenty impressions. To counter this, and allow for longer print runs, electro-plating (here called steelfacing) has been used since the nineteenth century to harden the surface of a plate. The technique appears to have been invented by the Housebook Master, a south German fifteenth-century artist, all of whose prints are in drypoint only. Among the most famous artists of the old master print: Albrecht Dürer produced three drypoints before abandoning the technique; Rembrandt used it frequently, but usually in conjunction with etching and engraving. 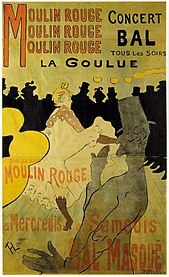 La Goulue, Lithograph poster by Toulouse-Lautrec. Lithography is a technique invented in 1798 by Alois Senefelder and based on the chemical repulsion of oil and water. A porous surface, normally limestone, is used; the image is drawn on the limestone with a greasy medium. Acid is applied, transferring the grease to the limestone, leaving the image 'burned' into the surface. Gum arabic, a water-soluble substance, is then applied, sealing the surface of the stone not covered with the drawing medium. The stone is wetted, with water staying only on the surface not covered in grease-based residue of the drawing; the stone is then 'rolled up', meaning oil ink is applied with a roller covering the entire surface; since water repels the oil in the ink, the ink adheres only to the greasy parts, perfectly inking the image. A sheet of dry paper is placed on the surface, and the image is transferred to the paper by the pressure of the printing press. Lithography is known for its ability to capture fine gradations in shading and very small detail. Josef Albers, Ralston Crawford, Gene Davis. Robert Indiana, Roy Lichtenstein, Julian Opie, Bridget Riley, Edward Ruscha, Andy Warhol, and Carlos Alvarado Lang. Screenprinting (occasionally known as "silkscreen", or "serigraphy") creates prints by using a fabric stencil technique; ink is simply pushed through the stencil against the surface of the paper, most often with the aid of a squeegee. Generally, the technique uses a natural or synthetic 'mesh' fabric stretched tightly across a rectangular 'frame,' much like a stretched canvas. The fabric can be silk, nylon monofilament, multifilament polyester, or even stainless steel. While commercial screenprinting often requires high-tech, mechanical apparatuses and calibrated materials, printmakers value it for the "Do It Yourself" approach, and the low technical requirements, high quality results. The essential tools required are a squeegee, a mesh fabric, a frame, and a stencil. Unlike many other printmaking processes, a printing press is not required, as screenprinting is essentially stencil printing. Screenprinting may be adapted to printing on a variety of materials, from paper, cloth, and canvas to rubber, glass, and metal. Artists have used the technique to print on bottles, on slabs of granite, directly onto walls, and to reproduce images on textiles which would distort under pressure from printing presses. Monotyping is a type of printmaking made by drawing or painting on a smooth, non-absorbent surface. The surface, or matrix, was historically a copper etching plate, but in contemporary work it can vary from zinc or glass to acrylic glass. The image is then transferred onto a sheet of paper by pressing the two together, usually using a printing-press. Monotypes can also be created by inking an entire surface and then, using brushes or rags, removing ink to create a subtractive image, e.g. creating lights from a field of opaque color. The inks used may be oil based or water based. With oil based inks, the paper may be dry, in which case the image has more contrast, or the paper may be damp, in which case the image has a 10 percent greater range of tones. Unlike monoprinting, monotyping produces a unique print, or monotype, because most of the ink is removed during the initial pressing. Although subsequent reprintings are sometimes possible, they differ greatly from the first print and are generally considered inferior. A second print from the original plate is called a "ghost print" or "cognate". Stencils, watercolor, solvents, brushes, and other tools are often used to embellish a monotype print. Monotypes are often spontaneously executed and with no preliminary sketch. Monotypes are the most painterly method among the printmaking techniques, a unique print that is essentially a printed painting. The principal characteristic of this medium is found in its spontaneity and its combination of printmaking, painting, and drawing media. Monoprinting is a form of printmaking that uses a matrix such as a woodblock, litho stone, or copper plate, but produces impressions that are unique. Multiple unique impressions printed from a single matrix are sometimes known as a variable edition. There are many techniques used in monoprinting, including collagraph, collage, hand-painted additions, and a form of tracing by which thick ink is laid down on a table, paper is placed on the ink, and the back of the paper is drawn on, transferring the ink to the paper. Monoprints can also be made by altering the type, color, and viscosity of the ink used to create different prints. 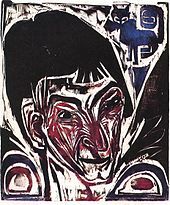 Traditional printmaking techniques, such as lithography, woodcut, and intaglio, can be used to make monoprints. Mixed-media prints may use multiple traditional printmaking processes such as etching, woodcut, letterpress, silkscreen, or even monoprinting in the creation of the print. They may also incorporate elements of chine colle, collage, or painted areas, and may be unique, i.e. one-off, non-editioned, prints. Mixed-media prints are often experimental prints and may be printed on unusual, non-traditional surfaces. Digital prints refers to images printed using digital printers such as inkjet printers instead of a traditional printing press. Images can be printed to a variety of substrates including paper, cloth, or plastic canvas. Dye-based inks are organic (not mineral) dissolved and mixed into a liquid. Although most are synthetic, derived from petroleum, they can be made from vegetable or animal sources. Dyes are well suited for textiles where the liquid dye penetrates and chemically bonds to the fiber. Because of the deep penetration, more layers of material must lose their color before the fading is apparent. Dyes, however, are not suitable for the relatively thin layers of ink laid out on the surface of a print. Pigment is a finely ground, particulate substance which, when mixed or ground into a liquid to make ink or paint, does not dissolve, but remains dispersed or suspended in the liquid. Pigments are categorized as either inorganic (mineral) or organic (synthetic). Pigment-based inks have a much longer permanence than dye-based inks. Giclée (pron. : /ʒiːˈkleɪ/ zhee-KLAY or /dʒiːˈkleɪ/), is a neologism coined in 1991 by printmaker Jack Duganne  for digital prints made on inkjet printers. Originally associated with early dye-based printers it is now more often refers to pigment-based prints. The word is based on the French word gicleur, which means "nozzle". Today fine art prints produced on large format ink-jet machines using the CcMmYK color model are generally called "Giclée". In art, foil imaging is a printmaking technique made using the Iowa Foil Printer, developed by Virginia A. Myers from the commercial foil stamping process. This uses gold leaf and acrylic foil in the printmaking process. Printmakers apply color to their prints in many different ways. Some coloring techniques include positive surface roll, negative surface roll, and A la poupée. Often color in printmaking that involves etching, screenprinting, woodcut, or linocut is applied by either using separate plates, blocks or screens or by using a reductionist approach. In multiple plate color techniques, a number of plates, screens or blocks are produced, each providing a different color. Each separate plate, screen, or block will be inked up in a different color and applied in a particular sequence to produce the entire picture. On average about three to four plates are produced, but there are occasions where a printmaker may use up to seven plates. Every application of another plate of color will interact with the color already applied to the paper, and this must be kept in mind when producing the separation of colors. The lightest colors are often applied first, and then darker colors successively until the darkest. The reductionist approach to producing color is to start with a lino or wood block that is either blank or with a simple etching. Upon each printing of color the printmaker will then further cut into the lino or woodblock removing more material and then apply another color and reprint. Each successive removal of lino or wood from the block will expose the already printed color to the viewer of the print. Picasso is often cited as the inventor of reduction printmaking, although there is evidence of this method in use 25 years before Picasso's linocuts. The subtractive color concept is also used in offset or digital print and is present in bitmap or vectorial software in CMYK or other color spaces. In printmaking processes requiring more than one application of ink or other medium, the problem exists as to how to line up properly areas of an image to receive ink in each application. The most obvious example of this would be a multi-color image in which each color is applied in a separate step. The lining up of the results of each step in a multistep printmaking process is called "registration." Proper registration results in the various components of an image being in their proper place. But, for artistic reasons, improper registration is not necessarily the ruination of an image. This can vary considerably from process to process. It generally involves placing the substrate, generally paper, in correct alignment with the printmaking element that will be supplying it with coloration. Protective clothing is very important for printmakers who engage in etching and lithography (closed toed shoes and long pants). Whereas in the past printmakers put their plates in and out of acid baths with their bare hands, today printmakers use rubber gloves. They also wear industrial respirators for protection from caustic vapors. Most acid baths are built with ventilation hoods above them. Protective respirators and masks should have particle filters, particularly for aquatinting. As a part of the aquatinting process, a printmaker is often exposed to rosin powder. Rosin is a serious health hazard, especially to printmakers who, in the past, simply used to hold their breath using an aquatinting booth. 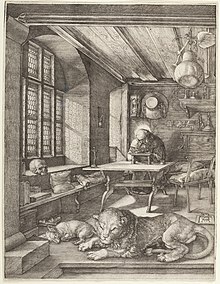 Albrecht Dürer, Saint Jerome in his Study, 1514. ^ Cohen, Brian D. "Freedom and Resistance in the Act of Engraving (or, Why Dürer Gave up on Etching)," Art in Print Vol. 7 No. 3 (September–October 2017), 17. ^ "Screen Fabric". A.W.T. World Trade Inc.
A. Hyatt Mayor (1971). Prints & people: a social history of printed pictures (full PDF). New York: The Metropolitan Museum of Art. ISBN 9780870991080. Edward Twohig, R.E. 2018. “Print REbels: “Haden - Palmer - Whistler and the Origins of the R.E. (Royal Society of Painter-Printmakers) ISBN 978-1-5272-1775-1. Published by the Royal Society of Painter-Printmakers, London, in May 2018. Wikimedia Commons has media related to printmaking. Look up printmaking in Wiktionary, the free dictionary. Wikisource has the text of the 1905 New International Encyclopedia article Print. Museum of Modern Art, New York: What Is a Print? Bellebyrd - The Print Australia blogspot by art historian Josephine Severn. Site dedicated to the activity of printmaking and thinking creatively. Includes footage of well-known artists working at Crown Point Press in San Francisco. This page was last edited on 23 March 2019, at 18:14 (UTC).